Editor,—Disseminated fungal infection is an important cause of morbidity and mortality in immunocompromised patients, often due to candida and aspergillus species. Endogenous endophthalmitis is a recognised complication.1 We present, to our knowledge, the first reported case of endogenous intraocular infection with the emerging pathogen Ochroconis gallopava, acquired following treatment for chronic lymphocytic leukaemia (CLL). A 69 year old man presented with a 4 day history of painless loss of vision in the left eye after receiving four courses of fludarabine (25 mg/m2 over 5 days) for CLL. Standard infection prophylaxis following myelosuppression included oral fluconazole 50 mg once daily. His neutropenia improved (7.96×109/l) but profound lymphopenia persisted (0.11×109/l). Visual acuity was right eye 6/6+4 and left eye hand movements. The right eye was normal throughout. Anterior uveitis, hypopyon, lens opacity, and vitritis compromised left funduscopy. A lymphoproliferative or infective aetiology was suspected. Anterior chamber paracentesis revealed leucocytes but no intact cells or organisms. Culture was negative. After 2 days of topical steroids vision improved to 1/60. A large preretinal grey/white mass at the posterior pole became evident with keratic precipitates on the posterior vitreous face. Systemic examination and investigations failed to demonstrate any focus of candidiasis. Oral fluconazole was increased to 400 mg daily. Intravitreal amphotericin B 0.005 mg in 0.1 ml saline was administered following vitreous biopsy. 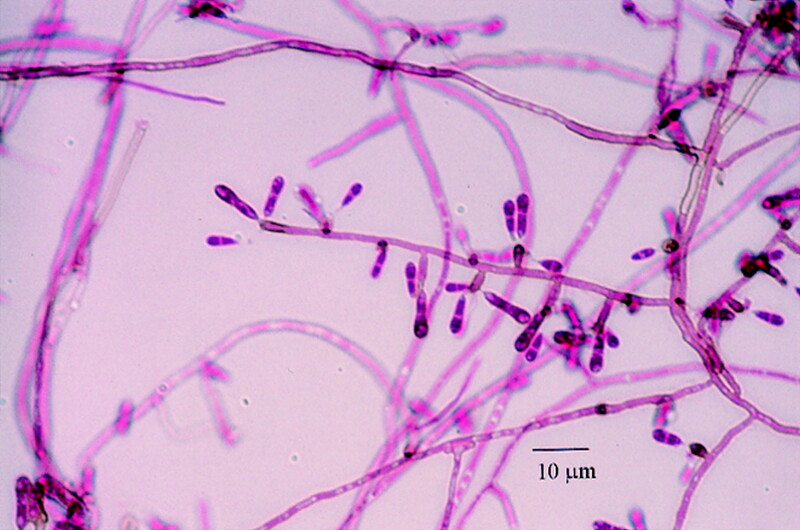 Microscopy revealed a filamentous fungus. An isolate was sent to the Mycology Reference Laboratory for identification. Intravitreal amphotericin B treatment was repeated twice at three daily intervals with initial visual improvement (2/60) but fell to hand movements with the development of a retinal “abscess” and infiltration surrounding the optic nerve. The isolate was reported as the saprophytic mouldOchroconis gallopava. The specimen was included in the National Collection of Pathogenic Fungi (No 7195) (Figs1 and 2) The minimum inhibitory concentration (MIC) for amphotericin was 0.5 mg/l and itraconazole <0.125 mg/l. Fluconazole was changed to intravenous amphotericin (0.6 mg/kg) but stopped after 14 days owing to deteriorating renal function. Though no neurological involvement was suspected clinically, concern over meningitic spread remained. Oral itraconazole 200 mg twice daily commenced. Evisceration was refused. Following informed consent an intravitreal injection of high dose amphotericin (0.02 mg in 0.1 ml) was performed. Visual acuity deteriorated to no perception of light. Dense lens opacity precluded further fundal examination. General debilitation ensued. The patient died 2 months later after congestive cardiac failure and sepsis from heel ulcers. A post mortem was not performed. Colonial morphology of Ochroconis gallopava after 10 days' incubation at 30°C on glucose peptone agar. The colony is a dark reddish brown colour with a diffusible pigment. The microscopic morphology of Ochroconis gallopava stained with lactofuscin. Pale brown, two celled conidia are produced on narrow cylindrical denticles. 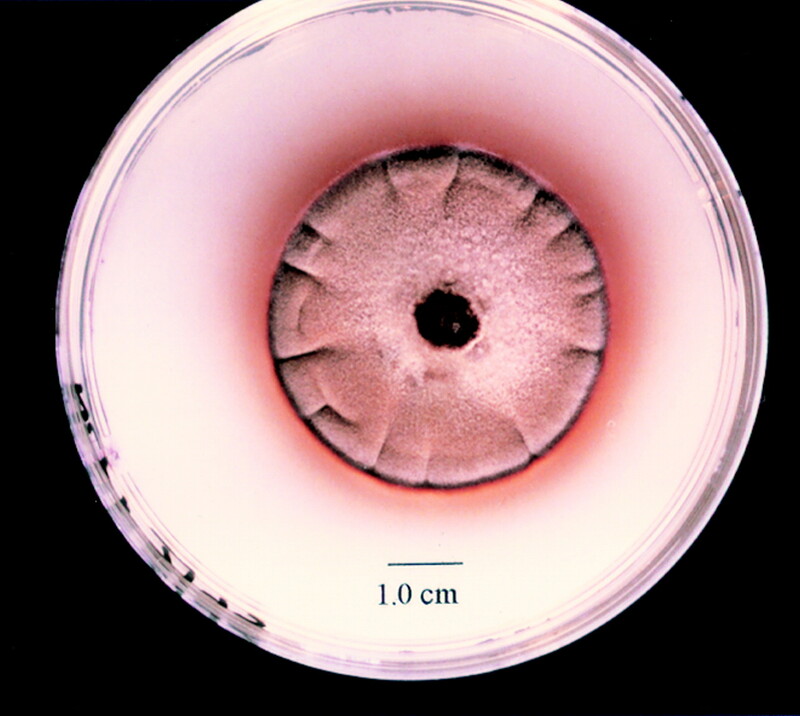 In our case of endophthalmitis vitreous biopsy was able to confirm the presence of fungal mycelium with isolation ofOchroconis gallopava in pure culture. Dematiaceous (dark pigmented) fungi are increasingly reported as potential pathogens in transplant recipients and patients immunocompromised following chemotherapy.2 These thermophilic fungi have been isolated from self heated waste piles, thermal soils, and chicken litter. The species O gallopava has caused significant mortality through encephalitis in turkey poults and chickens.3 A neurotropic potential is well recognised from the literature on avian disease and studied with animal models.4 Since 1990, eight cases of invasive systemic infection have been described in the world literature with brain abscesses as common sequelae and exceedingly high mortality.2 5 6 Six were transplant recipients, one had T cell CLL, and one large cell lymphoma. Neutropenia has not been a major predisposing factor to infection. More important is a long standing T cell mediated immunosuppression, in this case secondary to the underlying leukaemia and fludarabine. This nucleoside analogue, with good response rates in CLL, is the agent of choice when alkylating agents fail but results in myelosuppression with a more prolonged suppression of cell mediated immunity. Infection occurred despite prophylaxis with fluconazole, an observation previously documented.5 Fluconazole has excellent penetration into the cerebrospinal fluid and diffusion into ocular tissue.7 However, it appears to lack in vitro activity against O gallopava with a MIC of >100 mg/l.8 Successful treatment of cerebral abcess has been reported using systemic amphotericin B and itraconazole.9In our case renal function deteriorated on treatment and repeated intraocular injections were poorly tolerated. Although rare, invasive infections with O gallopava are aggressive and it is important that clinicians and laboratory personnel are aware of the significance of this organism in lymphopenic individuals who, even on fungal prophylaxis, may be at increased risk. (1994) Intraocular candidiasis in patients with candidemia. Clinical implications derived from a prospective multicenter study. Ophthalmology 101:1302–1309. (1997) Infections due to dematiaceous fungi in organ transplant recipients: case report and review. Clin Infect Dis 24:369–374. (1974) Isolation of Dactylaria gallopava from broiler-house litter. Avian Dis 18:445–451. (1986) Dactylaria constricta: another dematiaceous fungus with neurotropic potential in mammals. J Med Vet Mycol 25:55–58. (1995) Phaeohyphomycosis caused by Dactylaria (human dactylariosis): report of a case with review of the literature. J Infect 31:107–113. (1996) Dematiaceous fungi are an increasing cause of human disease. Clin Infect Dis 22:73–80. (1994) Fluconazole in the management of fungal ocular infections. Ophthalmologica 208:147–156. (1987) In vitro and in vivo drug studies with three agents of central nervous system phaeohyphomycosis. Chemotherapy 33:129–140. (1994) Successful therapy for cerebral phaeohyphomycosis due to dactylaria gallopava in a liver transplant recipient. Clin Infect Dis 19:714–719.